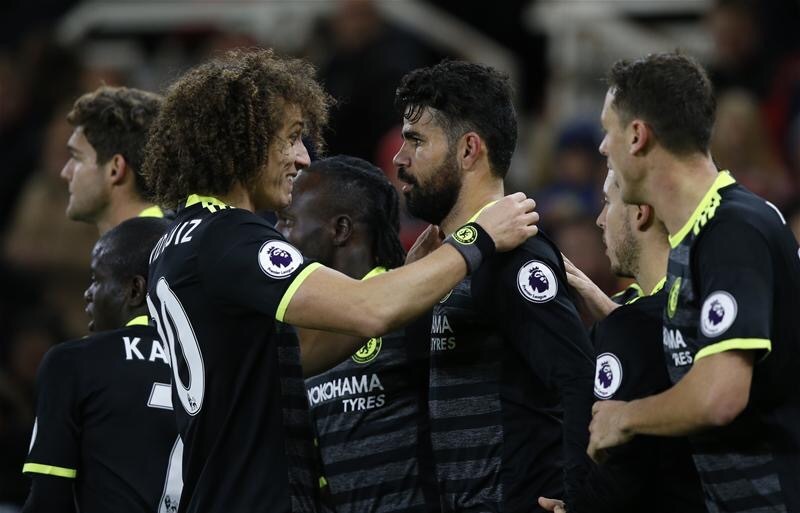 Diego Costa’s 10th goal of the season moved Chelsea top of the Premier League as their sixth straight win saw off Middlesbrough at the Riverside Stadium. After an even start, Chelsea upped the tempo and deservedly led at the break when Costa reacted quickest to drill in a loose ball inside the Boro box. Boro’s best chance came when Alvaro Negredo’s 78th-minute volley was saved. It was the only time the home side forced Blues keeper Thibaut Courtois into a serious stop as they lost for the first time in four matches. Following the arrival of former Juventus and Italy coach Conte, many expected to see a defensively-focused approach adopted by the Blues. However, they were porous in the opening two months of the season, culminating in the chastening 3-0 defeat at Arsenal on 24 September. Since then, the Blues have been impregnable in the Premier League. Conte made a tactical tweak to a 3-4-3 formation for their next game at Hull – and they have won all six league matches since without conceding a goal. Victor Moses and Marcos Alonso have been revelatory in their adopted wing-back roles, while Gary Cahill, David Luiz and Cesar Azpilicueta have looked assured in a back three. It has proved to be a masterstroke by Conte. And it has helped the Blues move top of the table for the first time since they were crowned champions in May 2015. Chelsea boss Antonio Conte was effusive in his praise of Costa before the game, labelling the Spain international as “one of the best strikers in the world”. On this evidence it is hard to disagree. While the former Atletico Madrid frontman did not find himself presented with plenty of goalscoring chances, he was constantly bothering the Boro centre-backs with his movement, strength and willingness to chase seemingly lost causes. And, most importantly, he was clinical when a sniff of an opportunity arrived. Boro failed to deal with Eden Hazard’s inswinging corner just before half-time, Costa reacting quickest to instinctively stab in an angled effort from inside the six-yard box. With Hazard quiet in comparison to recent weeks, Costa was the fulcrum of the visitors’ attacking play. The 28-year-old matchwinner also teed up chances for Pedro, Marcos Alonso and Hazard, showing once again he is back to the form which helped the Blues win the Premier League title 18 months ago in his first season at the club. History was not on Middlesbrough’s side going into the match, having lost their previous six matches against Chelsea without managing to score. A lack of cutting edge proved to be their undoing again. Marshalled by skipper Ben Gibson, the home side were organised and restricted one of the title contenders to a handful of clear-cut chances. While they only trailed by a single goal, Boro – who fought back to earn a barely deserved draw at Manchester City in their last outing – had hope. However, just one shot on target tells you where their problems lie. “We stayed in the game until the end but didn’t get the point we think we deserved. There are positives to take,” said Gibson. Middlesbrough manager Aitor Karanka told BBC Sport: “It is frustrating. We knew before the game we were playing against a top-of-the-table team. “But after our last performances against Arsenal and Manchester City we were confident and we showed again we can compete against those teams.